Places we have been to; those with hyperlinks have been written up- yes, we do have a bit of catching up to do! And many thanks to all of you who have let us use your pictures. Windermere - We have been here many times. 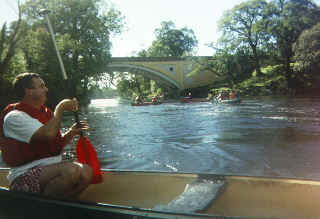 Lune - Devil's Bridge is one of our most popular venues for a day's canoeing. Easy to get to, free parking and, most of the time, offers both sheltered and moving water for beginner's and those with some skills. 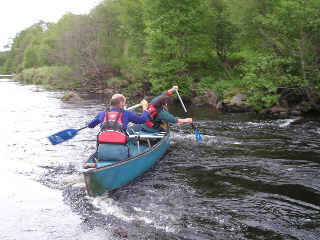 Sometimes, in wet weather, the river conditions are unsuitable for beginners, but may be good for advanced paddlers. In particular, Devil's Bridge offers a good introduction to moving water- ferry gliding, breaking in and out, and saftey practice. Ure - Access on the Ure is difficult. 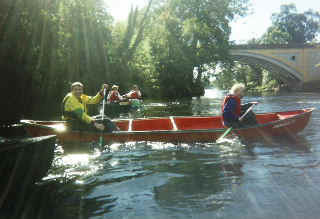 The Mickley to SleningFord section is a good paddle with bits to play on and Hack Falls (grade 3) to test your skills. You can camp at Sleningford Mill and use the 500 m or so of Grade 3 for practice. 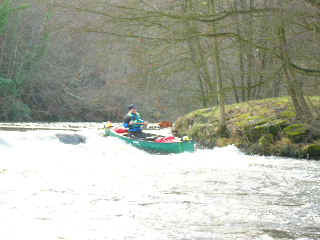 North Tyne - A good river trip, mostly grade 2 except for Warden's Gorge (grade 3). 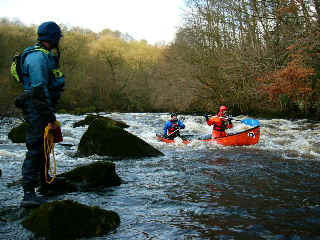 A good time to do it is on the Tyne Tour organised in early november by Hexham Canoe Club. You can start just below the Kielder dam and do the river in bits from there to Hexham. 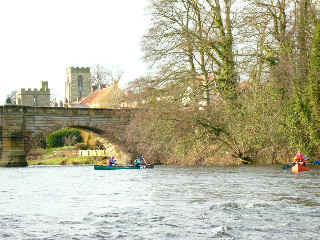 South Tyne - Haydon Bridge to Hexham - A nice easy grade 2 paddle with easy eddies in medium flow. Can be a bit thin. Really nice in autmn when you can enjoy the colours. Leeds Liverpool Canal - There are some good long stretches without locks that are good for a day out. One which we use is the Bank Newton to West Marton section. This winds about and gives good practice for dealing with the wind. Lancaster Kendal Canal - Nice isolated sections of canal due to the M6 motorway chopping it up so there is no through traffic for narrow boats. Start at Crooklands and go either north or south. Lots of fish. Loch Etive - A sea loch on the south side of Loch Linnhe. It has the most spectacular outlet to the sea at Connel Bridge which is awesome on spring tides. The further reaches of the loch are fairly isolated with places to hide a camp. 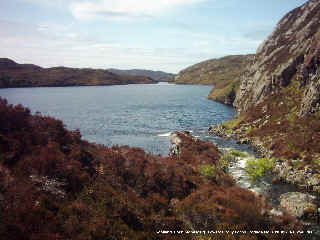 Assynt - Stunning scenery with mountains more or less starting straight from sea level. Interesting trips if you are prepared to portage your canoes more than a 100m or so. 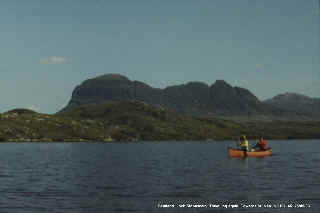 Elphin - Loch Veyatie - Suilven - Loch a' Guille - Loch Sionascaig - Stac Pollaidh - Loch Uidh Tarraigean - Loch na Dail. Also good day trip on south side of Stac Pollaidh: Loch Bad a' Ghaill - Loch Osgaig - Loch Lurgainn. Good campsite at the Brae of Achnahaird. Spey - A classic scottish river. 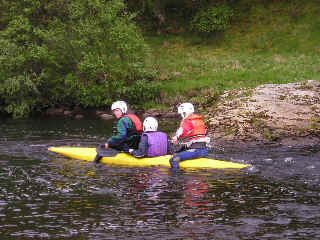 You can paddle from Laggan to the sea at Spey Bay Good camp site by the river at Newton More. Varied grade 2 to 3. Give yourself some time and don't rush it and don't right off the Laggan to Newton More stretch. We had a great time. Caledonian Canal - A good mix of canal and lochs in lovely surroundings. Expect interesting conditions on the lochs and be prepared to go for a walk as the waves can get pretty big with the wind tunnel effect of the Great Glen..
Wales - River Wye - Nice Grade 2/3 water from Rhayader to Builth Wells. Ireland - Liffey Descent - Nearly a 1000 entries, 17 miles and 9 weirs plus more. A great weekend on an exciting river with a variety of weirs to challenge you. You can either race in classes or take it a bit easier.Whatever you do, you will still have to meet the time deadlines. France - Ardeche - One of the lovely rivers running in a gorge off the Massif Central. You can use your own boat, or hire one with shuttle included. Stunning scenery and water you want to jump into. Goodcamping at Camp des Gorges below Pont d'Arc. Swedish tourist board trip - an introduction from an English angle to Swedes on Swedish Lakes! Sweden - Have a look at a map of southern Sweden. It's half water! Relaxing, uncrowded, unspoilt, some semi-wilderness. Dalsland Lakes - just too many pictures - here are a few taken when we were invited by the Swedish Tourist Board to see what their lakes were like. We used sea kayaks on that occasion and they were nice and comfortable. Kayak trip. 3 day recce trip from Nossemark to Lennartsfors. To make an enquiry or to book, please send us a message and we will reply to you.